Catch the bright stars of Leo — and visiting Saturn — from midnorthern latitudes in March and April by looking southeast and two-thirds of the way up the sky after dark. We're now more than a week into the spring season (even if,meteorologically, in some parts of the country it's still very much wintry),and high in our current evening sky the most famous stars of spring are to befound making up the constellation of Leo, the Lion. The most noteworthy star of this distinctive pattern is thebluish-white Regulus. According to Richard HinckleyAllen (1838-1908), an expert in stellar nomenclature, this star was known in Arabia as Malikiyy — "thekingly one." Yet, Regulus was seemingly alwaysassociated in ancient cultures with royalty and kingly power. Copernicus hasbeen credited with giving the star its present name, a diminutive of Rex, orking, which may also relate to the four so-called "Royal Stars" (withAldebaran, Antares and Fomalhaut) all situated about 90 degrees apart on the sky. As the brightest star in Leo, first magnitude Regulus has been almost universally associated in ancientcultures with the concept of royalty and kingly power. This star lies in thehandle of the so-called "Sickle of Leo," a star pattern resembling alarge reversed question mark. Regulus is 77 lightyears distant; meaning that the light you see emanating from it tonight startedon its journey toward Earth back in 1931, when Herbert Hoover was U.S.President, and Spain became a republic with the overthrow of King Alfonso XIII.The diameter of Regulus is estimated to be about fivetimes that of the Sun; its luminosity160 times greater. Algeiba ("the Lion'sMane") is in the curve or the blade of the Sickle, and appears as a singlestar to the naked eye. However, as a telescope of only moderate size willclearly show, it is really one of the most beautiful double stars in the sky.It should really be observed in twilight or bright moonlight to reveal thecontrasting colors ? one star has been said to be greenish, the other adelicate yellow. Others, however, have described different hues such as paleyellow and orange; reddish and golden yellow and even pale red and white! The Sickle, when rising and climbing the sky, as it is doingnow, is seen cutting upward. This year, there is also planetary interlopernearby in yellowish-white Saturn.Located to the left (east) of Regulus and shiningmore than twice as bright, Saturn is always a show stopper with its spectacularring system, visible even in a small telescope. 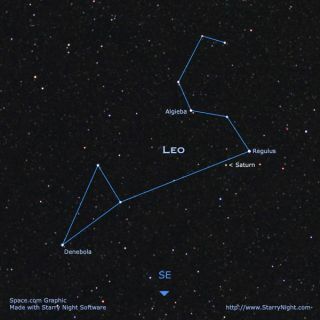 Eastward from the Sickle there is a right triangle of starsthat also belong to Leo. At the eastern point of this triangle you will find Denebola ("The Lion's Tail"). To modern skywatchers the Sickle outlines the majestic head and mane of a greatwestward-facing lion, with the triangle forming the lion's forequarters. He iscrouching in the regal pose somewhat resembling the enigmatic Sphinx.Astronomer Henry Neely (1879-1963), for many years a popular lecturer at New York's HaydenPlanetarium, would often use his electric pointer to draw attention to thesestars and then would exclaim: "Behold! Here is the lion known as Leo. Aconception that was familiar to the peoples of many lands long before a certainmotion-picture company adopted him as its trademark."